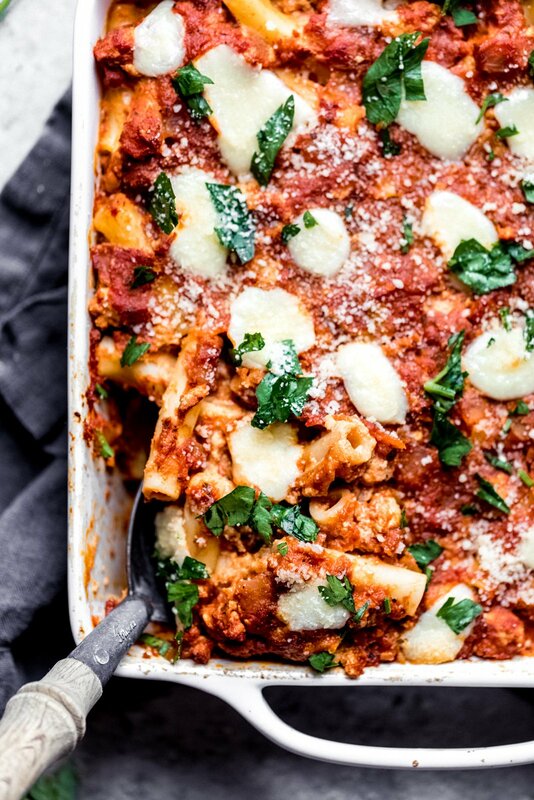 A new take on baked ziti with this lightened up saucy baked pumpkin pasta with creamy pumpkin puree, ground turkey sausage, red bell pepper, mushrooms, marinara, ricotta, mozzarella, parmesan, parsley and your favorite pasta! Welcome back to #AKPumpkinWeek! 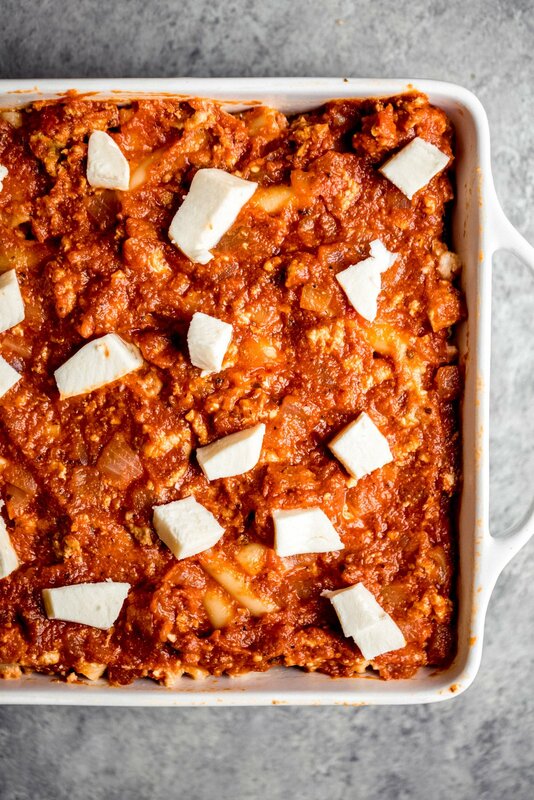 Today I’m sharing a deliciously creamy pumpkin baked pasta that’s gonna knock your socks off. Admittedly, pasta isn’t something I usually go for. Growing up, it wasn’t something that was on our dinner menu all that often. If anything, I had more noodles during my college years in the form of $1 creamy chicken ramen noodles with peas and extra cayenne pepper (thank you very much). Later on in life, I met my now husband, who adores pasta (he’s Italian so I can’t blame him). It’s taken me a bit of time to truly adore pasta but more recently I’ve fallen in love with how I’ve been able to incorporate veggies into our main pasta dishes; and admittedly, how easy it can be to throw a pot of pasta together when I’m feeling like I just wanna watch Billions. 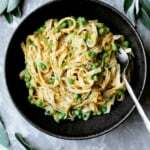 For example a few weeks ago, I made a super creamy thai peanut butter pasta on Instagram; it was fabulous and literally took 30 minutes from start to finish. But before I bring you that recipe, we MUST start with this baked pumpkin pasta, guaranteed to make you cozy this fall and winter. You see, sometimes pasta requires a little love and care to make it really, really good. So I started with a pumpkin puree infused marinara sauce mixed with turkey sausage, onion, garlic, mushrooms and red bell pepper. SO delicious and slightly sweet, plus you get the benefit and simplicity of using your favorite jar of sauce and a can of pumpkin puree (or make your own here)! Now it’s time for a little cheese! 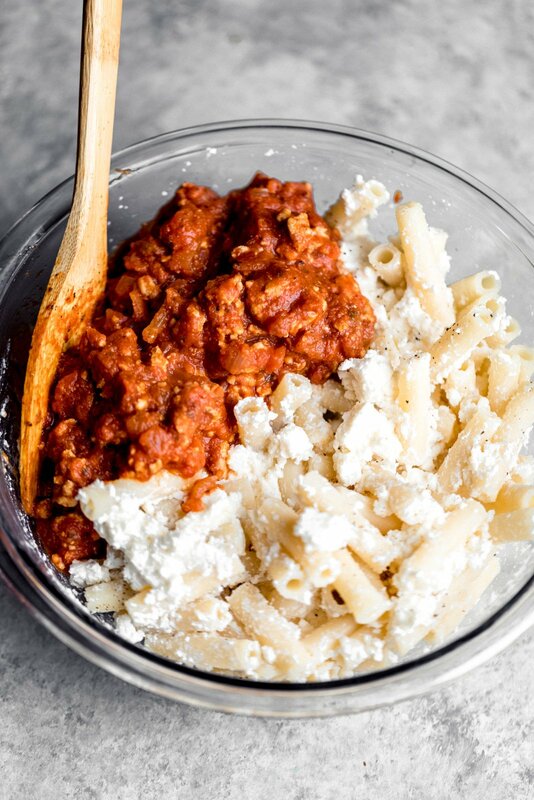 While the pasta boils, you’ll mix together ricotta, fresh chopped mozzarella (you can also use shredded), parmesan and parsley. Then add the pasta to get it nice and coated with cheesy goodness. The cheese isn’t overdone here, it’s well balanced and doesn’t leave you feeling heavy. You’ll mix a little of the sauce with the pasta/cheese mixture, then begin to layer in a pan. 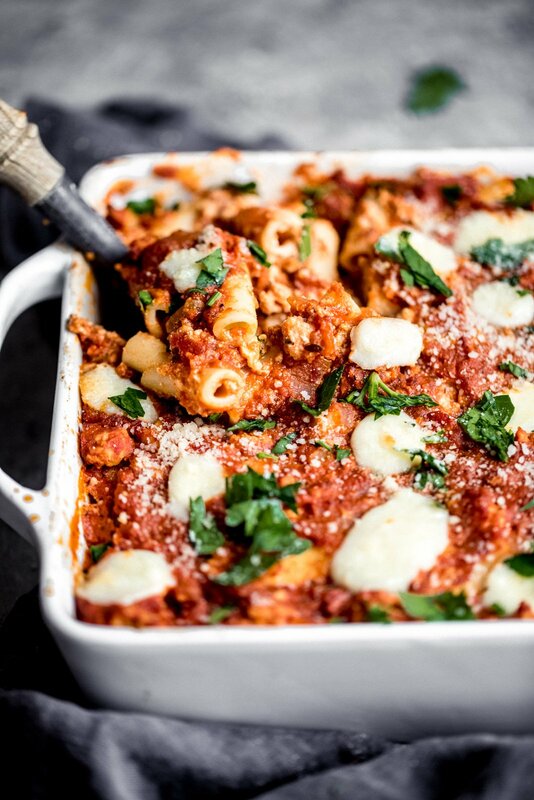 Pasta, sauce, extra mozzarella and then… repeat! Finally, you’ll bake it up and end up with a bubbly pasta dish packed with veggies, lean ground meat and delicious pasta. It’s creamy and SO comforting and you get a BIG serving. 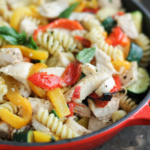 If you’d like, you can freeze this recipe for later and reheat too! 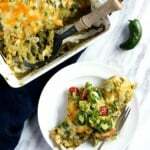 It makes excellent meal prep leftovers and is paired well with my famous crunchy herbed garlic bread. I hope you enjoy this recipe as much as we did. And of course, I hope you’re LOVING pumpkin week so far. Xoxo! 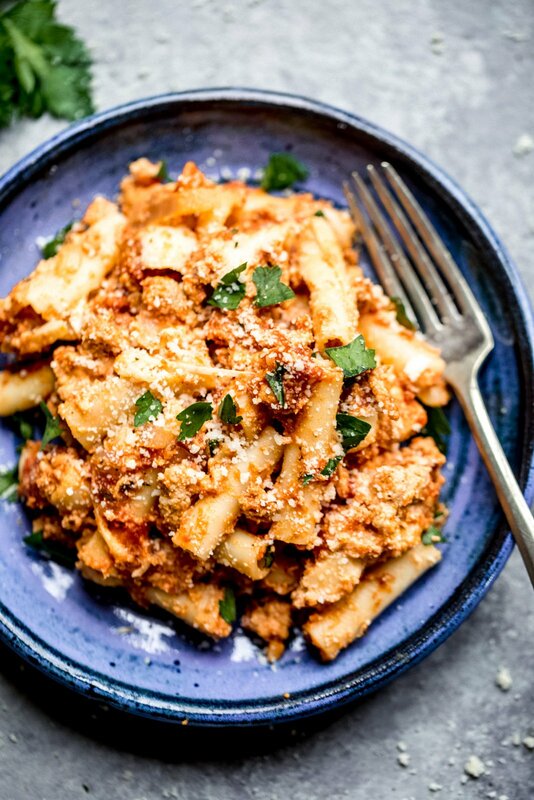 A new take on baked ziti with this lightened up saucy baked pumpkin pasta with creamy pumpkin puree, ground turkey sausage, veggies, marinara, ricotta, mozzarella, parmesan, parsley and your favorite pasta! Add olive oil to a large pot and place over medium-high heat. Add garlic and onions, red bell pepper and mushrooms and saute until onions begin to soften and mushrooms cook down, about 4-5 minutes. Next add in ground turkey, breaking up the meat, and cook until turkey is no longer pink. Add in the seasonings: italian seasoning, paprika, red pepper flakes, nutmeg and salt and pepper. Stir for about 30 seconds. to incorporate seasonings into the meat, then immediately add in the pasta sauce and pumpkin puree. Stir together, and reduce heat to low and simmer while you cook your pasta. Add water to a large pot of water and add a pinch of salt. Once boiling, add your pasta and cook until pasta is just barely al-dente. We want the pasta to have a nice bite to it. Once pasta is cooked, drain, then rinse with cool water. While the pasta cooks: Preheat oven to 375 degrees F. Grease an 8x8 inch pan (or 9x9 inch) with olive oil. Set aside. Next make your cheese mixture: In a large bowl, stir together the ricotta, ½ of the mozzarella pieces and parmesan cheese until just combined. Stir in the cooked pasta and 2 cups of the meat sauce. Add a little salt and pepper. Stir well to combine. Add half of the pasta mixture to the prepared pan. Top with half of remaining meat sauce and then half of remaining mozzarella pieces. Repeat with remaining pasta, meat sauce and mozzarella. Bake for 25-30 minutes or until pasta is bubbly. Let stand 10 minutes. Sprinkle with extra parmesan and parsley before serving. Serves 6-8. To make vegetarian: Use 1 can of white beans instead of the turkey. It will still be delicious! Just stir in the beans to the tomato sauce/veggie mixture. To make gluten free I suggest using your favorite gluten free pasta. I love Banza pasta brand. 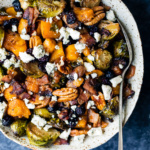 22 Responses to "Saucy Baked Pumpkin Pasta"
Does this work with brown rice noodles?! This looks so good! 🙂 Trying to pin it and keep getting “Sorry! 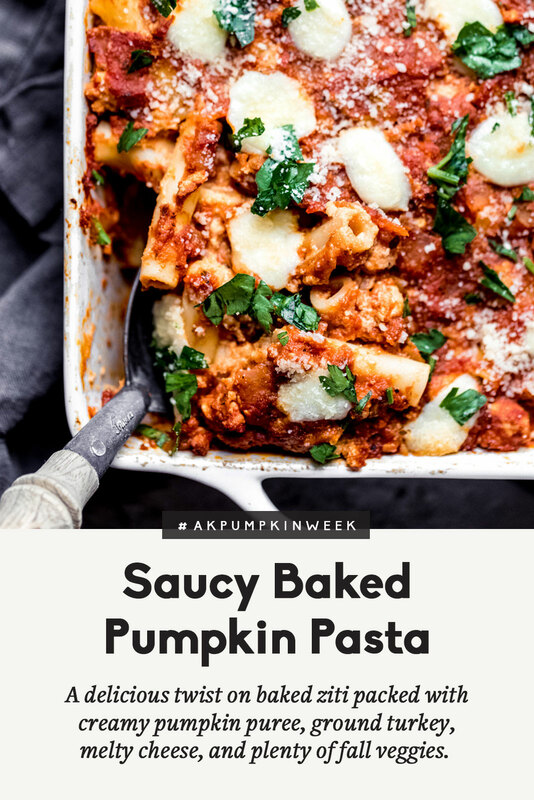 This site doesn’t allow you to save Pins.” I’ve tried using the Pinterest link on the photos and also this link https://www.ambitiouskitchen.com/saucy-baked-pumpkin-pasta/ on the Pinterest website with the same message. Any ideas? Thanks! Haha YES to the breadsticks! I haven’t dined at Olive Garden in a VERY long while but I am craving their breadsticks and a bowl of their whole wheat linguine with vegetables and their classic pasta sauce. 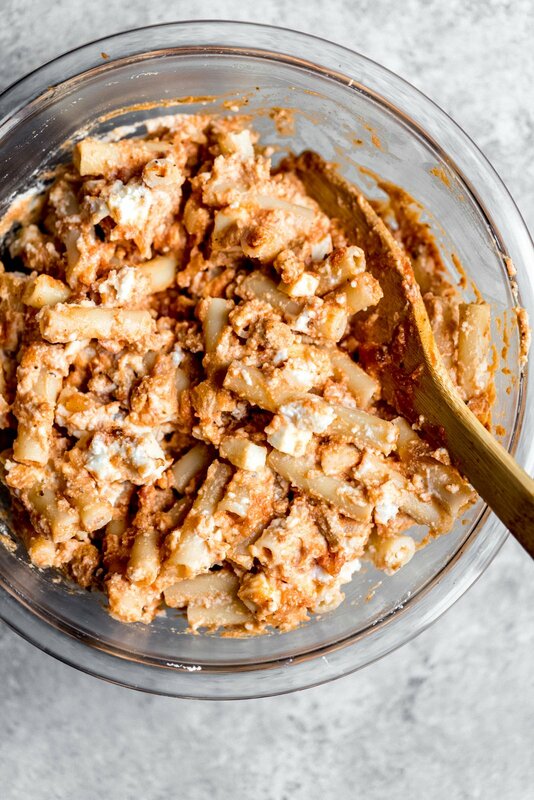 This pumpkin ziti looks like such a dream. My mother used to cook up baked ziti for dinner, but it’s also been a CRAZILY long while since those days too! Fortunately, we can change that! Wow! This one is a keeper. 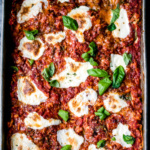 It was every bit as tasty as my time consuming and labor intensive lasagne, but it is way healthier and so much easier to prepare! Loved it!!! I’m so glad you loved it! A little quicker than lasagna 😉 but I’m sure yours is delicious. So I used butternut instead of pumpkin, and also got away with simply mashing it with a fork instead of blending it up. And we did the white beans ’cause turkey isn’t readily available here. An absolute hit with my hubby and two toddlers! It really was divine, thank you! My mom is skeptical about pumpkin things, but I got her to try this recipe with me. She loved it! The pumpkin isn’t too noticeable in the taste because it blends well with the other ingredients. Saucy is a good description–so delicious and perfect for a cold, rainy evening! Thank you! Hi! 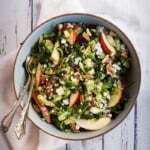 I am also having trouble pinning any recipes from your site. 🙁 I’m going to make this for Sunday dinner! Looks SO good! Hi Valeria! We had a tech glitch that is now resolved 🙂 enjoy! So tasty! So cheesy! I doubled the recipe so I could freeze one. I felt like I had more sauce than I needed, so I kept some aside to freeze for an easy dinner in the future. I’ve got three kids (2 months, 2 years, 4 years), so I love a recipe that lets me invest about one hour of time and get three tasty dinners. Monique you have done it again! Fabulous recipe my family and I enjoy this very much. I made my homemade tomato sauce and it taste great with the pumpkin. Can’t wait to try another recipe.